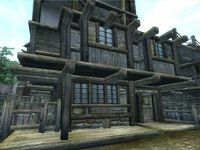 Henantier's House is a home in the middle of Bravil located underneath Aleron Loche's House and next to Carandial's House. It is the residence of local Mages Guild member, Henantier, and consists of one zone: Henantier's House. His house contains two interesting chests: one containing some gold and a slim chance (10%) of jewelry and another which has a 75% chance each of containing three random pieces of armor. There are also two empty petty soul gems to be found, as well as a scroll of absorb agility. The spare bed used during the quest is owned by the player, and is therefore free to sleep in. Henantier carries the key to this location. Esta página foi modificada pela última vez à(s) 21h48min de 18 de setembro de 2013.